This Historic Victorian Mansion, located in an old coal-mining town in Mahanoy City, Pennsylvania offers you an experience of days gone by. The Mansion was owned by brew master Charles D. Kaier, founder of the Charles D. Kaier Company. Mr. Kaier spared no expense in creating a home to incorporate all of the grandeur and elegance associated with the Victorian Era. Joan and James Goodman purchased the mansion in 1991 and converted this masterpiece into a bed & breakfast. This Victorian Second Empire home was built in 1874 by Peter Otterbach, one of the first petitioners of the Mahanoy City charter. After his wife and young child died, Otterbach could no longer bear to live in the home he planned to spend many happy years with his family. He sold it to Matlida and Dr. Louis Weber. 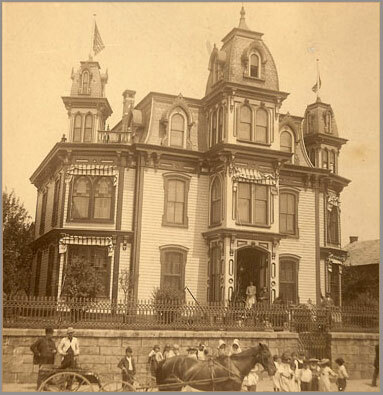 The Weber’s eventually sold the home to Margaret Curry Kaier and Charles D. Kaier, founder of the Kaier Brewery, on May 11, 1891 and it became known as the Kaier Mansion. The Mansion was sold 100 years later in April 1991 at auction to Joan and James Goodman. Following a 13-month restoration, the Goodman’s reopened the Kaier Mansion as a Bed & Breakfast. Charles D. Kaier and Margaret Curry Kaier had ten children. Seven reached the age of maturity. Ella, the oldest married John B. Lieberman, Josephine married Michael Haughney; Margaret married her brother-in-law John B. Lieberman when her sister Ella died; Mary who was called Mame married Lloyd W. Fahler; Cresentia married Richard Kirby; Charles F. married Ester McGinty and Amelia the youngest married Henry Schreyer. The Kaiers had three other children, Bridget, Anna and Troian Anselm, who all died at a very young age. Mr. Kaier, a native of Biningan Baden, Germany, opened Kaier Brewery in 1862, which was producing 100,000 barrels of beer a year by 1912. Connected with the brewery was one of the finest bottling departments in Eastern Pennsylvania. One can get some idea of the completeness of the Kaier plant when it is realized that this concern makes all its own wagons and harness, has its own cooperage shop, its own blacksmith shop, carpenter shop, tinsmith shop, plumbing shop and the largest individual ice plant. He gave to Mahanoy City one of the safest, prettiest, and best equipped opera houses in the interior of Pennsylvania. He was one of the largest real estate holders in Mahanoy City. He became one of the best-known men in this section of the state and never lost an opportunity to help Mahanoy City grow or to encourage industry. Charles D. Kaier died in 1899 and his wife was made president of the Kaier Brewery and their only surviving son, Charles F. Kaier, was made Secretary-Treasurer. Through the generations, Kaier descendants have occupied the Kaier Mansion. The graves of the Kaier family can be seen in St. Fidelis cemetery in the family plot. When the last remaining resident died, the heirs auctioned off all the furnishings. Four months later in April of 1991, the home was also auctioned and was purchased by Joan and James Goodman. Joan Goodman opened the Mansion as a Bed and Breakfast in 1992. Some of the first guests to stay at the Kaier Mansion Bed and Breakfast and the first guests to sign the Guest Book were Mr. and Mrs. Joseph L. Huta, on May 23, 1992. During the next sixteen years, guest who resided as close as Mahanoy City, Pennsylvania and as far away as Continental Europe have stayed at the Mansion. The Kaier Mansion has been used for many charity events to benefit Mahanoy Area Historical Society with Christmas tours and Victorian Garden teas. A re-enactment of a card game that happened 100 years ago in the Kaier Mansion was on A Ghosts of Mahanoy City Tour, to benefit the Mahanoy Area Molly Maguire Historical Park Committee. The bedrooms in the Kaier Mansion are named after the Kaier family. Bedroom 2 is called the Charles D. Kaier Suite; Bedroom 4 is called the Margaret Curry Kaier Room; Bedroom 5 is called the E. & M. Lieberman Suite named after Ella and Margaret Kaier. Ella was married to John B. Lieberman, when Ella died John B. Lieberman married her sister, Margaret Kaier. Room 1 is called Mame Kaier Fahler Room and Room 3 is called Champagne Charlie Room. © 2017 Kaier Mansion Bed & Breakfast. All rights reserved.